Register for the 26th Annual Shamrock 'N' Run 5K today! Go-Green Dinner Tickets ($5per) — $6.00 ea. Buy Go-Green Dinner Tickets for yourself, family members and friends!! 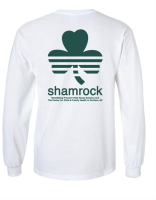 The Shamrock 'N' Run T-Shirt — $20.00 ea.